When I was in Phoenix, everyone told me I had to take an hour and a half drive north to see Sedona. I heard it was pretty, but nothing could have prepared me for the incredible beauty I would experience. Many like to visit Sedona for personal enrichment and feel a spiritual connection. Others just go for the day to take a refreshing hike through the red rocks. I did both. 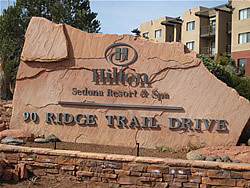 My friend, Paul, met me there from LA and we checked into the Hilton Sedona Resort and Spa. We were very impressed with our fireplace suite, which overlooked the beautiful red rock formations. Excited to explore, we dropped off our luggage and ventured into uptown Sedona. Along the way, we passed a variety of shopping options from outlet stores to beautiful art galleries. We also stopped into one of many places that offered psychic readings and carried a vast selection self-help books. We decided to skip a reading and check out Uptown Sedona. Here you’ll find various art galleries, jewelry shops, and restaurants. We browsed around and then headed back for dinner at Hilton’s Grille at Shadowrock, where we enjoyed some great Southwestern fare, including a delicious spicy pecan salad, trout, and a scrumptious sweet potato mash. The next night we tried the salmon, which was also equally enjoyable. After dinner, we relaxed in the outdoor jacuzzi under the clear sky and spotted a few shooting stars. Our second day in Sedona was absolutely amazing. 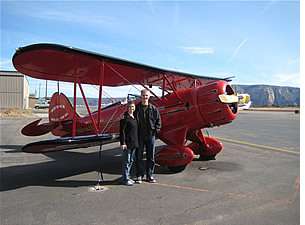 We started our day with a biplane tour of the red rocks. If there is one thing you do while there, that should be it! Daniel Finch McCaffrey is the director of adventure at the Hilton and he definitely hooked us up! We drove to the local airport, which was just about a ten minute drive from the hotel and were greeted by the staff at Sedona Air Tours. Eric was our pilot and he did a great job showing us how to get into the plane and suiting us up with our head gear. The ride was extremely smooth as he guided us over all the different rock formations. It was the most spectacular site I’ve ever seen. The topography was absolutely breathtaking and plenty of pictures were taken for memories. In case your pictures from the air aren’t enough, there is a beautiful scenic spot to take some more as you leave the airport. After our biplane tour, we strolled around Tlaquepaque, a plaza full of fine art galleries, shops, and restaurants. I would recommend making this another stop on your trip on your way to or from the airport or Uptown Sedona. After we had our fill of browsing the shops, we went for a mini hike up Red Rock mountain. It was fun picking up red rocks along the way. 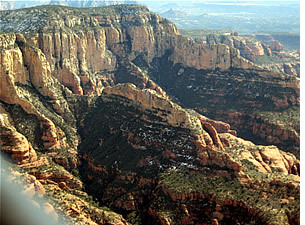 If you’re really adventurous, you can hike to the top, which they say is one of vortex sites in Sedona. We never made it to the top, but we swore we could feel the positive energy radiating downwards! After our hike, it was time for relaxation. We went back to the hotel and got ready for one of the best parts of the trip. We were going to receive a 90 minute massage. The “full circle” is their signature treatment, which includes a variety of massage modalities to provide balance and harmony of the mind, body, heart and spirit. The therapist, Heather, went over with me everything that could be included in the session and then let me pick which ones I wanted to include. I chose them all. The treatment started with a balancing of my charkas, as she recited inspiring mantras. Next came a combination of a hot stone, deep tissue, and sweedish massage. It definitely took me into a deep state of relaxation. If you’re looking to get a great exfoliation of your skin, I also recommend the body polish, which includes either a salt or sugar scrub and silky moisturizers. Finish off your spa experience with a soak in the Jacuzzi or relaxing in their steam room or sauna. We ended our trip the next morning with a workout in the fitness center and the buffet breakfast, which included a wide array of breakfast favorites including delicious fresh fruit, oatmeal, yogurt, granola, and various muffins, bagels, eggs. What an amazing journey we had in just a couple of days. A trip to Sedona should definitely be on your list of things to do real soon!